Thermodynamic formalism and all its branches and applications represent active and rapidly developing areas of modern mathematics that include the study of dynamical systems, ergodic theory, geometry, number theory, quasicrystals and stochastics. The aim of this workshop is to provide a platform for the exchange of knowledge through research talks, open-problem sessions and round-table discussions, in order to bring to light new aspects and gain new insights to problems which occur in these areas and their intersections. As a founding father of several theories which helped to shape the thermodynamic formalism, this event is dedicated to Manfred Denker's 75th birthday. The goal of the workshop is to enhance connections, collaborations and exchange of ideas within the Dynamical Systems & Ergodic Theory community in Northern Germany. The one-day workshop will be a recurring event, taking place twice a year. For more information, visit the conference website. Keßeböhmer, Marc; Munday, Sara; Stratmann, Bernd. 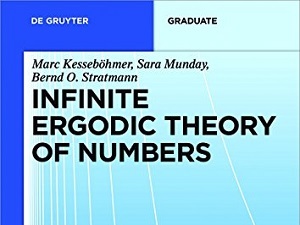 Infinite Ergodic Theory of Numbers. De Gruyter Textbook, 191 pages.